When you provision the SmartCloud Application Workload Services, you have the option to store all data on an existing volume. For doing that, you just need to create a volume in the same data-center first and an IP address then enter the storage ID and the IP address while provisioning the SmartCloud Application Workload Services. Note, it is an ID not the name of the volume because the ID is unique. Two volumes can have the same name. One the service is active, you can see a hyperlink to ‘Restore service instance’. This means the SmartCloud Application Workload Service will be deprovision and automatically reprovisioned. During the deprovisioning phase, the volume will be dettached and re-attached during the reprovisioning. The same IP address will be kept. 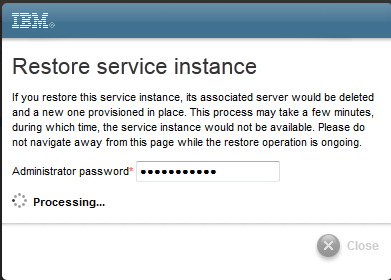 Once you click on the ‘Restore service instance’ for security reason you will be asked for the administrator password. This is useful if your service instance is stuck or not accessible anymore. You will end-up with a brand new instance but all data will be kept.